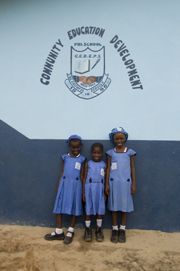 The Kola Tree Community Primary School, funded by Discovery Summer, was opened in September 2010. The whole community was overjoyed at finally having a 6-classroom permanent school building enabling all the children in the community to benefit from primary education. A deep well was dug in the compound for the benefit of both schools and community; separate latrines were constructed for boys and girls - all vital components to the smooth functioning of a new school. After a meeting with the Kola Tree community leaders in February 2011, it was agreed to build a Junior High school, adjacent to the primary school. All students who successfully pass their National Primary Examinations at the age of 12 qualify for a place. In addition, a number of scholarships were offered by Discovery Summer to support those who would not otherwise be able to attend. Construction of Stage 2 of the project started as soon as the rainy season ended in November 2011 - and the Junior High School opened in Summer 2012. This, too, has 6 classrooms, a well and latrines. A Library / Resource Centre and Administration Block were part of this stage of the project. An outdoor stage has been included in the design which is where all students practise public speaking - which the Principal is very keen for every student to excel at. Each summer, ambitious fundraising efforts at our Summer centres raise significant funds to support this continued effort. If you would like to donate to this very worthwhile cause, please contact us. "Today is the happiest day in my life. For a very long time, we never had a school in this community. Children used to attend school in other communities. In the early 90s one mission set up a church in an unfinished building in the community. 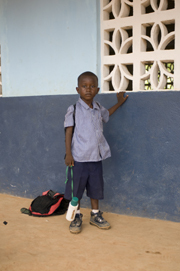 After some negotiations with the mission we were allowed to use the building as a non-formal school. We started with 30 children and were running the school from community contributions. We also hired one teacher. The mission attempted to take over the running of the school but could not continue because of lack of funds. So the school closed down in 1994. Around 1995, CADO, with support from ActionAid, came and trained community animators on the use of participatory tools. Using these tools, we all came to an agreement that the school was our priority need. We took over an old poultry shed and set up a second school. We had many challenges such as the lack of furniture and learning materials. Children were asked to come with benches from their homes. This time, we employed two trained and qualified teachers because the number was increasing and we wanted to gain recognition from the Government. The school suffered another setback when the rebels attacked in 1999; the school was completely vandalised and the head teacher killed. We had to close again. We were able to start all over again in 2000 when ActionAid supported us with construction, teaching and learning materials. Since then we started pushing for government recognition and support. The other serious problem we had was the non availability of land for school construction. We had to organise ourselves as community people and met the Minister of Lands who later gave us a portion of land where this school stands today. I nearly burst into tears when ActionAid in 2009 said they had secured funding for the construction of the first school in my community. Now that both schools are completed I feel very proud because all our efforts for the past years have yielded fruit. Our children can now access free and quality education. As a member of the School Management Committee, we will monitor the teachers so that they can teach the children well, as well as ensuring that all children in this community go to school. We are going to work with the councillor and chief to see that this happens. Thanks to ActionAid and Discovery Summer for the wonderful opportunity given to this community."